USANA, word! : Spring into Action with a focus on Bone and Joint Health! Spring into Action with a focus on Bone and Joint Health! With the winter chills behind us and with longer hours of sunshine, it’s time to shake off those winter blues and get active. Getting out and getting active is a fabulous thing you can do for yourself – to soak up the fresh air, shake off the winter pounds and to strengthen your bones, joints and muscles. While for a few of us, this may be as easy as tying up those jogger laces and sprinting out the door, it may not be that simple for many! With a large population of women and men who struggle with bone health issues, it is not as easy as it sounds. Bone health issues are a key deterrent to leading a normal active life and therefore it is important to start looking after your bone health at an earlier age rather than later in life. Some of the foremost bone health issues faced by many are: decrease in bone mass, osteoporosis and osteoarthritis. Some of the primary causes for decrease in bone mass among younger women are smoking and excessive alcohol use. Pregnancy and breast feeding can lower bone mass as well. Women undergo rapid bone loss after menopause when their level of the bone strengthening hormone oestrogen drops dramatically. Young women and girls should concentrate on building strong bones, to reduce their risk of bone health issues such as thinning of bones and osteoporosis later in life. The situation is quite similar for men, whose bone mass peaks around the age of 20 years. From there on, it is vital that men ensure they have sufficient intake of calcium and vitamin D to keep their bone health from deteriorating with age and activity or lifestyle factors. Osteoporosis is responsible for almost all the hip fractures in older people. The statistics are alarming! Every 5-6 minutes, someone is admitted to an Australian hospital with an osteoporotic fracture. This is expected to rise to every 3 - 4 minutes by the year 2021, as the population ages and the number of osteoporotic fractures increase. Ensuring you consume enough calcium and vitamin D, commencing earlier in life, along with adequate exercise can reduce the incidence of bone health issues at a later age. With World Osteoporosis Day being celebrated on 20th October, the time is right to create awareness about the issues surrounding this disease, the crippling effects it can have on your normal daily life, and its prevention. Learn for yourself and educate your family and friends about the benefits of Calcium and vitamin D, and their role in the prevention of bone health issues. 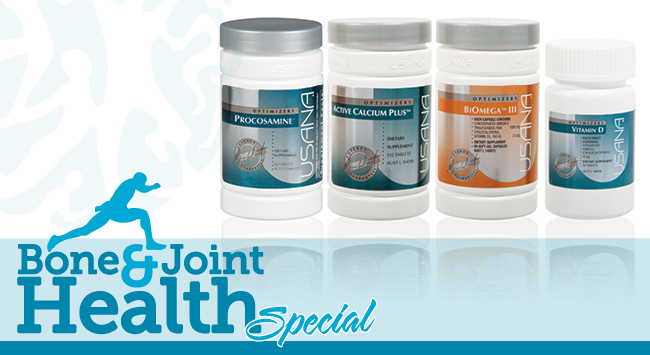 So this spring, let us spring into action and give our bone and joint health a boost with USANA’s Bone and Joint Health Special! Click here for a flyer on the special or SHOP NOW!